Voice your opinion! Review Glitter Monster Crafts now. Randomly stumbled upon the site while browsing for creative ideas for Easter. I was surprised at all the different ideas for cards. 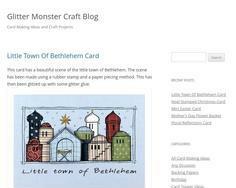 The site is very simple and easy to use, the card crafting is very well explained so you can follow the card creation step by step. It just makes it so easy and fun. Is Glitter Monster Crafts your company?